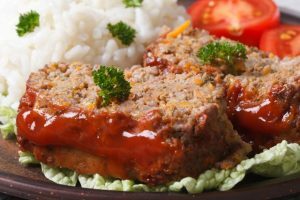 This All American Meatloaf recipe uses a combination of ground beef, pork and veal in an easy-to-prepare and quick-to-cook recipe. Obviously the title is presumptuous because I am convinced that every state has their own version that is claimed to be “All American Meatloaf”. This recipe is just the one I happen to like most. Remove crusts from bread and place in the bowl of a food processor. Process until fine crumbs form, about 10 seconds. Transfer bread crumbs to a large mixing bowl. Do not substitute dried bread crumbs in this step as they will make your meatloaf rubbery. Place carrot, celery, yellow onion, garlic and parsley in the bowl of the food processor. Process till vegetables have been minced, about 30 seconds, stopping to scrape down the sides of the bowl once or twice. Chopping vegetables this way saves time and ensures that vegetables will be small enough to cook through and not be crunchy. Transfer vegetables to bowl with the bread crumbs. Add 1/2 cup ketchup, 2 tsp dry mustard, pork, veal, beef, eggs, salt, pepper, Tabasco, and rosemary. Using your hands, knead the ingredients until thoroughly combined, about one minute. Be careful not to over knead; doing so will result in a heavy and dense all American meatloaf. The texture should be wet, but tight enough to hold a free-form shape. Set a wire baking rack into an 11 by 17 inch baking pan. Cut a 5 by 11 inch piece of parchment paper and place on the center of rack to prevent meatloaf from falling through. Using your hands, form an elongated meatloaf covering the parchment. Place the remaining 3 Tbsp ketchup, remaining 2 1/2 tsp mustard, and brown sugar in a bowl. Mix till smooth. Using a pastry brush, generously brush the glaze over meatloaf. Place oil in a medium saucepan set over high heat. When oil is smoking add red onion. Cook stirring occasionally till onion is soft and golden in places. Add 3 Tbsp water, and cook, stirring till most of water has evaporated. Transfer onion to a bowl to cool slightly and then sprinkle onion over the meatloaf. Bake 30 minutes then sprinkle rosemary needles on top. Continue baking for a further 25 minutes. Let your All American Meatloaf cool on the rack about 15 minutes. 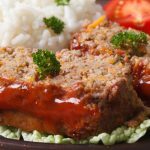 This All American Meatloaf recipe uses a combination of ground beef, pork and veal in an easy-to-prepare and quick-to-cook recipe. Obviously the title is presumptuous because I am convinced that every state has their own version that is claimed to be “All American Meatloaf”. This recipe is just the one I happen to like most. 1/2 tap chopped fresh rosemary plus more needles for sprinkling If using dried herbs, half the quantity.